What's Up New Haven: Project Storefronts - New Haven Events! Project Storefronts - New Haven Events! Part of the beauty of our New Haven community is that people are willing to share these cool events going on around town. In turn, I can write about it and share these events with you! We have Vivian on Twitter to thank for providing us with the Project Storefronts events, held at 45 Church Street (cross: Crown Street). Events include beauty, wellness, Pop-Up shopping, live music and more! 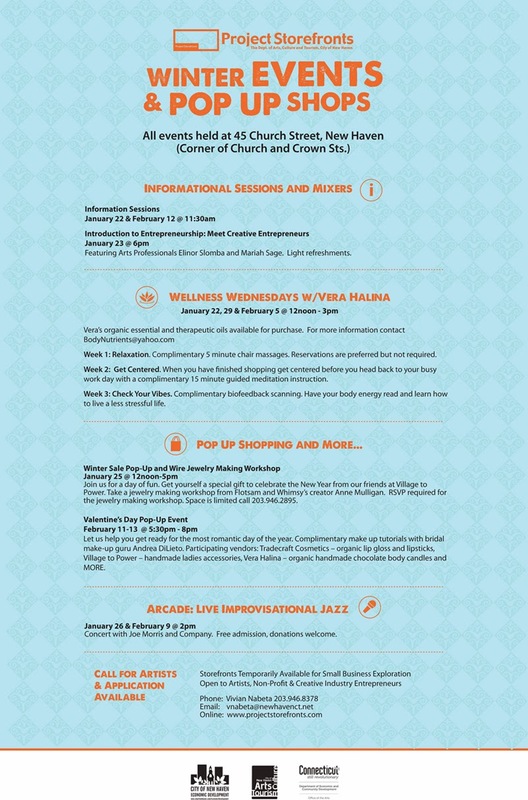 Check out details on the flyer below or by downloading the January/February schedule here. **Events were cancelled for today, 1/22, but it sounds like all future events are a GO!